Sounds so much more elegant than ... Trout Mousse, or Trout Dip. Doesn't it? The French just have a way with words. I just love the way they make the most monotone conversations, texts or articles so lively with the mere sing-song harmony of their language. I remember when I was back at school doing my A' levels I had chosen both French and English literature as my subjects. While I thoroughly enjoyed reading Shakespeare, Keats and co. in my English Lit. classes, it was actually Maupassant's wonderful short stories like, Mademoiselle Fifi, that had me captivated. After all these years I have terribly neglected my French and really am annoyed with myself for letting go of this wonderful language. I still try to keep up a little with my French reading though. I might not be reading Maupassant in French today but I am certainly reading my, one or the other favorite French food blogs! Keeping it French on WFLH I thought I would dedicate this one to the sweetest French girl I have had the pleasure of meeting in Blog-o-World! She also happens to be hosting this month's HHDD #11 where she appropriately chose Mousse as the theme. I had already made Chocolate Mousse even a Chocolate Mousse Tart and just wanted to try something different. Not sweet but savory. I had a rough idea of what I wanted to try my hand at and the original recipe was a Salmon Mousse I found in a German cooking magazine. However, I played around with it so much that this is what became of it. The salmon turned into a trout! I present to you my result - Mousse de Truite! Put the fish, cress, lemon zest, 2/3 of the lemon juice, olive oil and the cream cheese in a blender (or you can use a pureeing machine) and puree the ingredients for a minute. The mixture should be nice and creamy - mousse-like! Add salt and pepper to taste. Fill into small bowls or one large bowl and serve with warmed crispy brown bread. If you are preparing this mousse for a party or cocktail this recipe allows you to prepare in advance. Placed in a the refrigerator this will keep fresh for two days. It's just very important to keep it covered and cool. You can use any smoked fish for this mousse, e.g. salmon or mackerel. You can also replace the herbs I used with dill or tarragon for example, giving a completely new flavor each time. Trout in general is a healthier type of fish to eat. It is leaner than most other fish and provides a good source of omega-3 fatty acids. It is also an excellent source of Niacin and Vitabin B12. So, I was happy to be serving a "lighter" version of this mouse. It takes approx. 20 minutes to whip up and tastes just heavenly with slightly toasted dark German bread. Tom, who enjoys fish extremely, had never been served trout in the form of a mousse. He found having fish this way, without the usual potatoes and veggies on the side, just spectacular. 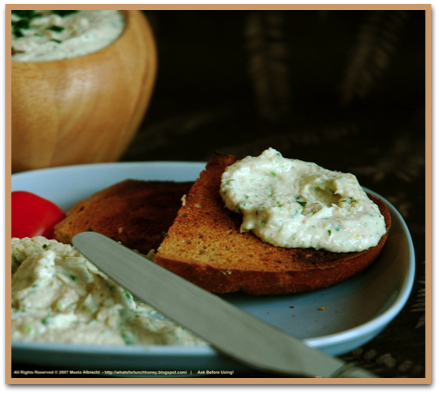 Soeren is a fan of anything he can dip or spread and this was just perfect to get him to eat healthy fish. The herbs add an extra flavor to the dish and the vibrancy of the lemon reminded me once again of the vitality everything French has. This looks and sounds amazing. I have actually never had trout before, but I would love to give this a try! Now this is something that Hubbs would adore! What a great way to use trout.. way to go sweetie! Thanks, Meeta. I am going to try this. One question - the fish must be smoked? Lovely article! You must have gone to school in the UK then if you did A Levels? The mousse looks delicious and I love trout! Oh Meeta, we can practice any time! Pas de problème ! 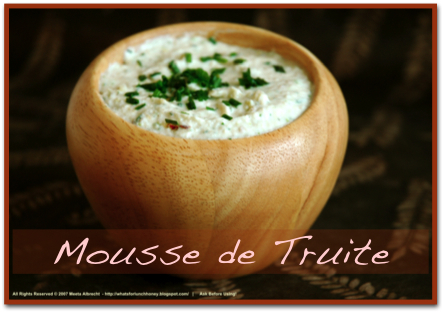 ;-) Your mousse de truite sounds heavenly! Thanks for your sweet note! Ooh! A savory mousse! Great job! This is such a great answer to the HHDD challenge. Looks good! Your post made me blush all around...Thank you for the sweet note. Yep, we can be knuckleheads sometimes, but we know when to hang on to a good thing! Would you believe me if I tell you I did not make the correlation between the HHDD theme and my nationality until you pointed out the obvious! I must be having senior moments! This looks and sounds fabulous Meeta. Will have to try this soon. Love the presentation. Hi Meeta... great idea making a savoury mousse! Generally speaking, I really like trout. But I love smoked trout! Nice job on your savory mousse. Cynthis Smoked fish is the most flavorful for this type of dish as poaching and other methods do not manage to leave that smoky flavoring. FreyaActually I went to school in Qatar. It was a British School called The Doha College. Once again thank you for your kind comments. Let me know what you think. Meeta this would be perfect with a glass of reisling. Thanks for joining in at HHDD. Ohh, that looks delicious! 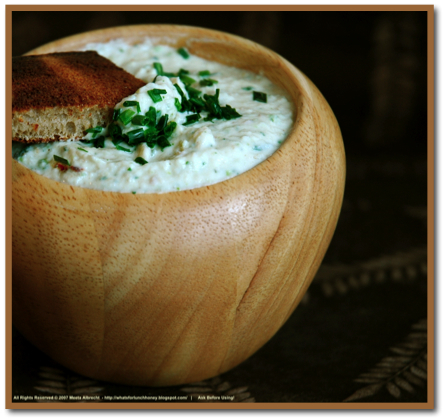 I've made a very similar dip, but didn't use cress, just parsley and dill. Yet I can imagine that the sharpness of cress would be nice with the smoked fish. Lovely idea, and beautiful pictures! Oh, Meeta my dear, I don't care *what* you call it -- this looks fantastic!